This year I turned 40 and, looking back, my gaming habits appear to have aged as well. In 2013, I probably acquired more titles and played fewer of them, overall, than in any other year. My pile of shame is so large it might spontaneously combust. Some of this is because I'm the site's jock, and sports video games—provided they're good—offer an infinitely replayable experience with no story to complete. Two good titles with career modes can drop you out of the current discussion in other genres for months. So this is probably why my list of top games is limited to eight. It's because I've found myself retreating to familiar experiences, ones I know I'm good at, ones set in a world where my own emergent narrative is as much a part of the story as the framework supplied by the game's authors. This isn't always the case, but it is a consistent theme through my top games of 2013, presented here in no particular order. There's a large constituency in Grand Theft Auto V that has played more of its online mode than the singleplayer story, and I belong to it. I can't even remember where I am in the main campaign, and will probably restart it once I get done with this post. Hell, I spent two days doing nothing but playing but golf in it. Don't get me wrong, the golf isn't terribly great, but at least you get to beat someone to death when you shank the approach on No. 16. The cart isn't a great getaway vehicle though, especially for the cop cars that spawn on the fairway. On the subject of golf, each time I come back to this game I'm impressed at how authentic and deterministic its analog controls are (provided you are playing on advanced difficulties.) EA Sports took a game in which you mostly dialed in coordinates like an artillery officer and now gives you a challenge in which you set an optimal target but have a reasonable range of expectations for hitting it. That's golf, even for the world's best. The inclusion of an historic mode, giving you old clubs, old-timey presentation, and even the old Augusta National layout, was well designed and delivered. All four major tournaments, under their own names, in the career mode—plus the inclusion of an LPGA Tour and its season's first major tournament—make this game more than capable of surviving a one-year hiatus and the departure of its title star. I will still play a lot of Tiger Woods PGA Tour 14 in 2014. Speaking of career modes, the one you get in Black Flag is just as engrossing and allows for your own emergent narrative of heroism and glory as any you'll find in a sports title. I approached Black Flag cynically, thinking that if Ubisoft wanted to make an open-world pirate game, it didn't need the pretext of the Assassin's Creed canon to do so. Perhaps it still doesn't, but I found that the standard AC backstory, even thinly layered onto this, makes it shades more compelling than a stock pirate tale would be. It's hard for me to bridge the boundless opportunity offered by an open world video game with the often relentless pace of its core mission set. Not here. You're exploring the past, after all, not just reliving or recreating specific events as past editions of this series so often do. This is a sentimental favorite, and I'm including it here largely because the series said goodbye in September after a 20-year run, the past 17 under this name. At least it went down fighting—both in court and on the consoles. NCAA 14 won't be timeless—next year four more schools will enter college football's top division, and the new four-team playoff format will be introduced to the postseason. None of that can be played in the current game. A lot of its value will depend on how long EA Sports supports roster sharing and the Ultimate Team mode it introduced this season. As a finale, though, it's worth my ovation. While I have written that the Wii U is irrelevant to sports video games, that doesn't mean the console sits unused in my household. That's largely thanks to Super Mario 3D World. (and Lego City Undercover, too.) I adored Super Mario 3D Land on the 3DS, and all the reasons it delighted me, and more, are present in its Wii U sibling (although those Toad exploration puzzles drive me up a wall, especially when I tilt the damn Gamepad inadvertently.) This is Nintendo at its best, the charming toy-maker of video gaming. 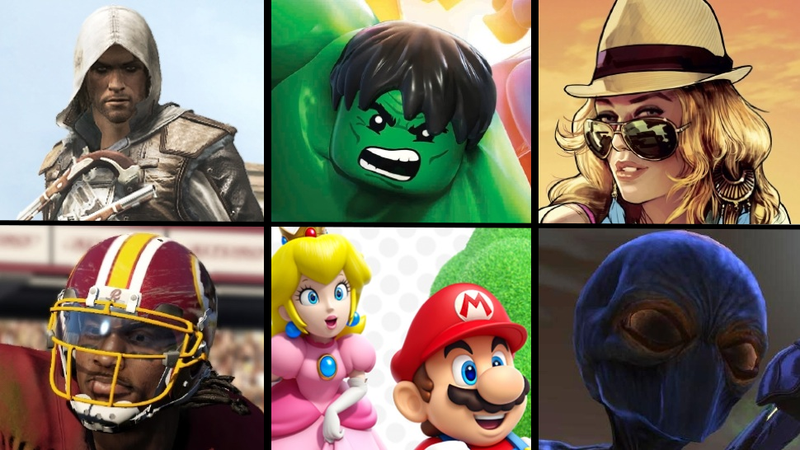 I'll be honest and say the Marvel license is the big reason this, and not LEGO City Undercover is among my finalists. Both are open-world LEGO games and both feature exploration, collectibles and side missions galore. But I can't throw cars in LEGO City Undercover the way I can with Hulk or Thing in LEGO Marvel. And the unlockable characters (Ant-Man! But not Stilt-Man ...) are a lot more interesting. Hell yes, this counts as a video game of 2013. It's a completely redone XCOM, not just a pack of maps or a set of prelude or epilogue missions to last year's story. The new MEC troopers and gene-modified soldiers completely reshape combat against the extraterrestrials, and add another critical decision to your background strategy. Little additions—like soldiers speaking in their native languages, and the medals you can award them—make what was already a fantastic game into the ultimate XCOM experience. I flunked Madden on the Xbox 360 and PlayStation 3; too much of it was the same as the previous year's edition—transformative though it was—and the whole thing felt held back, as if EA Sports was sacrificing development on one console generation for the next. Then Madden NFL 25 released for the Xbox One and PS4, and my colleagues in New York said they could tell no difference between it and its past-gen siblings. Visually, they're right. In graphics, Madden offers an incremental improvement at best—and the broadcast package does little to nothing to support it. (It drives me nuts that coaches now wear headsets on the sideline—hooray!—and also in the postgame handshake. WTF?) But Madden 25 on the next gen consoles is a slow burn, especially in how it satisfies the principal complaint I had with its last-gen predecessors: offensive line blocking. Pockets form recognizably; pulling guards and tight ends attack downfield more sensibly; lanes open up more clearly. Every day I play it I'm shown or reminded of something worth going back to in Madden NFL 25 where, previously, that replayable urge was largely because of your Ultimate Team or an online dynasty with a bunch of friends nagging you to finish your week. My inbox is filled with outrage about other games' unresolved glitches and bizarre virtual economies; Madden, quietly, has had a smooth release with none of those complaints. Madden NFL 13 changed the series dramatically; but Madden NFL 25 on the next generation was video gaming's comeback player of the year, and provides real optimism for 2014.